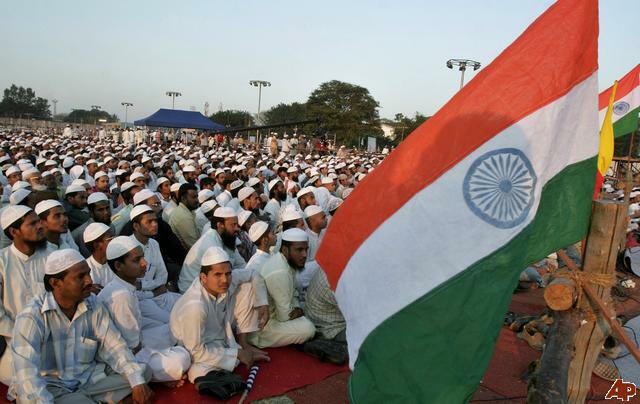 An educated, secular and liberal Indian Muslim is in a bind; he is torn between finding the right balance between loyalty to his faith and adherence to the new tests of patriotism being imposed by certain intolerant groups. The high voltage saffronisation wave that is demonising Muslims has broken the resistance of even strong neutral and secular groups who are now inclined to go with the official tide. The centuries old secular souls is slowly being ruptured. India has suddenly become deaf to its minorities who are shuddering with muteness at the growing intolerance of saffron hordes. Mocking and ridiculing of Muslims is now rife in public spaces. India’s once cherished and internationally lauded secular values have been drowned in the sea of primitive majoritarian politics which is driven more by uncontrollable rage than by sensible reason. Not just Hindutva foot soldiers but democratic institutions and spaces are being used to suppress religious freedom. We are fast seeing a potential breakdown of what was a flourishing multicultural society. Muslims are made to routinely confront a culture of fear which sees everything Muslim as pure evil. I can feel the disdain emanating from officers when they look at my passport and find I havea Muslim name. Other friends — much richer and better known than most of us — will tell you how difficult it is to rent a house if you are a Muslim.A sense of despair runs through the entire Muslim community and they are passing through the most horrific phase post Partition. Continuing inebriation on account of political popularity has emboldened the intolerant elements in the ruling party, who are now openly imposing their own moral benchmarks with regard to diet, dress, faith and patriotism totally overlooking the cultural sentiments of others. This rhetoric is injecting anti-Muslim sentiments in a climate when Muslims are already feeling alienated and marginalised. The political and social environment has never been so hostile. An ordinary Muslim is being hissed and snarled with vileness by all and sundry in full glare of the law. Why do people stare at me when I wear my skull cap or Hijab? Why does my name force people to doubt my love for my nation? Why do I hear comments like “You will be supporting Pakistan during a match”? Why do I not get a good apartment on rent in a posh locality? Why do people call me staunch if I pray fives time in a day? Why am I called an orthodox Muslim if I follow my religion to the best of my capacities? Why are the boys of my community under constant surveillance? Why am I not an Indian as much as you are? The majority Indian Muslims not only have to worry about worsening communal relations and police brutality, but also face high unemployment and widespread poverty. They live in urban ghettos or squalid villages and suffer from ignorance, ridicule, humiliation and The profound sense of pain caused by calculated and senseless ridicule of their religious practices only serves to alienate them from the national mainstream. India must not forget that it has an entire generation of young Muslims who are born into a turbulent era, and whose mindset and identity is being nurtured in an environment where they apprehend being suspected as ‘disloyal others’. Some of them are highly talented and are in the vanguard of the nation’s new development revolution. The negative profiling of Muslims can cause alienation among the Muslim community; and as a result of this alienation, there will be enough space for fissiparous tendencies leading to long term fissures. Studies have shown that one of the factors underpinning radicalisation is a sense of loss of belonging and identity. An analysis of 198 countries by the Pew Research Centre finds India is the fourth-worst country in the world for religious intolerance and violence. Only three countries — Syria, Nigeria and Iraq — are before India in this name-and-shame list, and even Pakistan fares much better than India on this front, being in the tenth position. Muslims have been forced to think deeply about their role in present day political climate in India. It isn’t so much a battle of what it means to be a Muslim in India. It’s a greater battle between broader India, of how tolerant and open-minded it will be about minorities, about Indian values of democracy and secularism, about recognising how true they want to be to the Indian values of openness and freedom for all. Of late, the Indian secular fabric is increasingly becoming fragile. Many on either side don’t believe in either tolerance or moderation and are determined to follow the age old adage ‘paying them in their own coin’ too literally. The official machinery which had earlier been by and large very subtle in it communal agenda is now baring its fangs brazenly. Religion is often portrayed simply as a social or political construct, although for millions of people, religion is a daily practice, and the very real framework of an understanding that connects human lives to a spiritual reality. For the laity, faith is the prism through which they view the world, and their religious communities are their central environments. For them it is a benign force, shorn of the political sentiments which are manipulated into an ideological construct by ideological groups for their election algorithms. Taking that verse to heart and getting to know other people and coming together on issues that are common to all of us can synergise a new spirit of bonhomie. We’re all concerned with education and poverty, growing inflation, surging unemployment and taxes, where we can find common ground and work towards a better world and better future for all of us. There is much in common among people irrespective of the faith they profess. It is this which needs to be explored. We need to be able to see the other and say ‘we understand you are different, but we also understand the difference’. There is ample scope for reconciliation if only we are willing to avail of the myriad opportunities staring at us. Despite the many superficial differences, all our deeper and more permanent values are similar. The respect for knowledge, justice, truth, compassion towards the less privileged commitment for healthy family life, and the striving to improve our world and make it a better place for everyone are commonalities to people of all faiths. A more sobering reflection can help us smoothen the ridges that keep straining our relationships. The majority must realise that the minorities face a severe emotional complex. An ordinary Muslim carries a lot of weight on his shoulders; having a lot of responsibility. Having responsibility to his own community and responsibility to his fellow Indians to not only convey the right impression of Islam but embody the principles of nationalism deemed correct by the majority. You have to be an exemplary, upright and righteous individual; people are going to look at you and judge other Muslims based on your conduct. I have to be on my guard all the time because I know people are looking and they generally are going to associate any actions I do as representative of my religion. We’re all ambassadors of whatever we are. You’re an ambassador to your faith and society as you live your lives. It is not what you profess or preach that matters; it is finally your actions that define you and your thoughts. Your public perception is built over a period of time and is shaped by the uniformity in your speech and behaviour. A dichotomous behaviour is bound to erode your credibility and your loyalty to your faith can very well be misperceived as disloyalty to national values. The cardinal values that underpin your faith and your patriotism are normally shared by each other: ethical conduct and pluralist character. There’s always a certain level of bias initially when people meet you. I think that the main challenge is having those conversations and getting people to a level where they stop seeing you just as a Muslim, but a fellow Indian and person of faith. It is equally true that in recent times the highly volatile and hostile environment has made the situation very complicated. Proffering advices is easier said than done. Being Muslim and being Indian are compatible and go hand-in-hand. You don’t need to compromise your faith to prove your patriotism; real patriotism is demonstrated through the timeless values of Indian civilisation — fairness, justice, tolerance and pluralism. “[In] the age of globalization and of the ever-accelerating intermingling of elements in which we are all caught up, a new concept of identity is needed, and needed urgently. We cannot be satisfied with forcing billions of bewildered human beings to choose between excessive assertion of their identity and the loss of their identity altogether, between fundamentalism and disintegration. But that is the logical consequence of the prevailing attitude on the subject. Muslims are faced in a dilemma of dichotomous loyalties and the best inspiration for them in these trying times is of Maulana Azad who was the president of Indian National Congress during the negotiation of independence and was a key ally of Gandhi and Nehru. ‘I am a Musalman and am proud of that fact. Islam’s splendid traditions of 1,300 years are my inheritance. I am unwilling to lose even the smallest part of this inheritance. The teaching and history of Islam, its arts and letters and civilisation, are my wealth and my fortune. It is my duty to protect them. ‘As a Musalman I have a special interest in Islamic religion and culture, and I cannot tolerate any interference with them. But in addition to these sentiments, I have others also which the realities and conditions of my life have forced upon me. The spirit of Islam does not come in the way of these sentiments; it guides and helps me forward. ‘I am proud of being an Indian. I am part of the indivisible unity that is Indian nationality. I am indispensable to this noble edifice, and without me this splendid structure of India is incomplete. I am an essential element which has gone to build India. I can never surrender this claim. ‘It was India’s historic destiny that many human races and cultures and religions should flow to her, finding a home in her hospitable soil, and that many a caravan should find rest here. Even before the dawn of history, these caravans trekked into India and wave after wave of newcomers followed. This vast and fertile land gave welcome to all, and took them to her bosom. One of the last of these caravans, following the footsteps of its predecessors, was that of the followers of Islam. India has been a flag bearer of pluralism and has always held the candle of tolerance, mutual respect and peaceful coexistence. Muslims have time again responded to the challenges of the nation and facts and history attest to their role in building this great nation. Alienating one fifth of this population will not help the country and will be against the spirit of its centuries’ old ethos.